Like a good man, the healthiest cereal is hard to find. Did you know that some varieties of granola can pack in as much as 12 grams of fat in just one serving? Other cereals, such as those chocolate or fruit flavored kind, can have as much as 30 grams of evil sugar per serving as well. Not good. 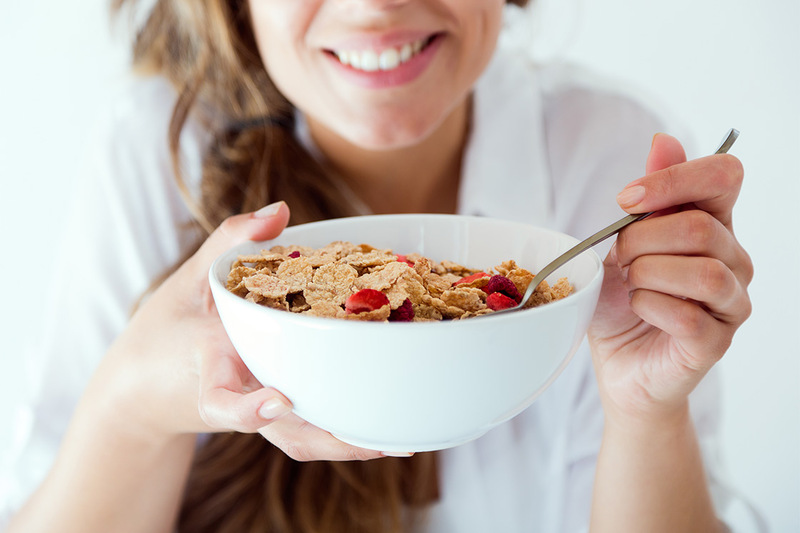 Low-fat and low-sugar (or no sugar) healthy cereals are your best option, but knowing additional nutritional facts about each one can help you select the most nutritious options. For instance, according to the Mayo Clinic, enjoy breakfast cereals that include whole-grain cereals, such as whole-wheat bran flakes, shredded wheat or oatmeal. For those of you who believe cereal isn’t just for breakfast anymore, the good news according to the researchers of a BMC Medicine study say that “eating enough whole grains and cereal fibers can also reduce your risk of an early death, mostly due to illnesses such as diabetes, cancer, and respiratory disease.” Here are 10 of the healthiest cereal choices that will help you keep the pounds off, while avoiding loading up on unnecessarily high levels of sodium, fat and sugar content. When Business Insider asked dozens of nutrition experts what they ate for breakfast, the oatmeal and Greek yogurt combo was a clear winner for healthiest cereal. Oats contain more fiber than any other grain. Full of omega-3s, these golden, multi-bran flakes were rated one of the best flax cereals by Real Simple. Plus, everybody digs their cute, cuplike shape. Mayo Clinic recommends it because it’s high in fiber and has no sugar in each serving. Low in fat, it has all your essential vitamins and minerals including zinc and folic acid. ABC News’ medical contributor Dr. David Katz says this is the healthiest cereal because it has twice the fiber (5 grams per ¾ cup serving) and less than half the sodium of Honey Nut Cheerios. While Cheerios does contain one gram of sugar per bowl, these o’s from your childhood are actually made from whole grain oats. Pour us a second bowl! Although this dense and filling cereal contains 5 grams of sugar, it also contains 9grams of fiber per half cup and is fortified with high levels of iron. Crumble some on top of low-fat yogurt with banana and strawberries. This iron-filled and slightly sweet mix of crunchy whole grain flax, rolled oats, bran strands and corn flakes delivers high fiber all the way until lunchtime. The first two ingredients of healthy cereal should be whole grain, bran, fruit, or soy, according to the Center for Science in the Public Interest “Best Bites” rating system. These flakes made the cut. With their zero fat and one gram of sugar and fiber per one cup serving, these whole-grain, gluten-free puffs are a more nutritious choice than those that snapple crack and pop. Add fruit for more fiber. This oldie but goodie contains 100 percent whole grains and plenty of vitamins. To liven it up, add Greek yogurt, oats and a fresh fruit sweetness.